Since many of our products are usable in many ways, it is likely to be selected and chosen as gift in various occasions. Here are some of the examples of how these pieces can be used in plurality of ways. One of the main features of pure 100% tin is that it is soft and flexible. So flexible that you may easily bend within your hand. Our flexible wares is a group of products that is focusing on this material character. For example, our KAGO-Square-L. This is one of our popular products; not only for their self demand, but also as a special gift. It is set in a flat box, and once it is opened, it becomes versatile piece. 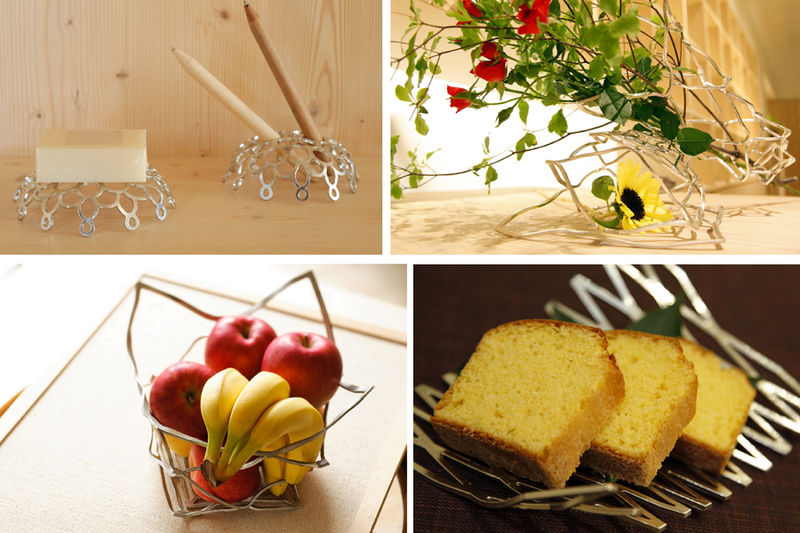 Our flexible series can be used as a fruit basket, wine bottle holder, baguette basket, plate-on-plate set on a porcelain/glass wares, pen stand, decoration for the flower vase or a holder for flower arrangement, pendant lampshade, etc. Because it is known to absorb impurities and purify water, tin wares allow you to enjoy liquor, meals, sweets, or even flowers. 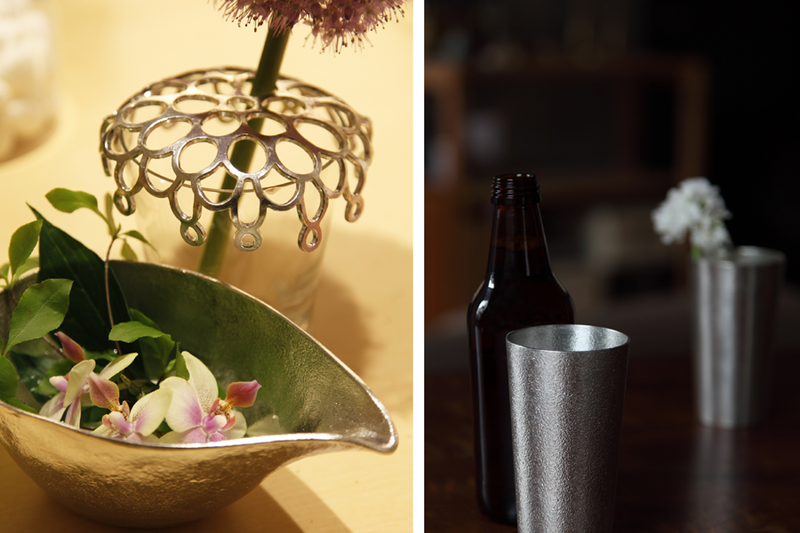 Cut flowers may last a while longer when using a vase made of tin. 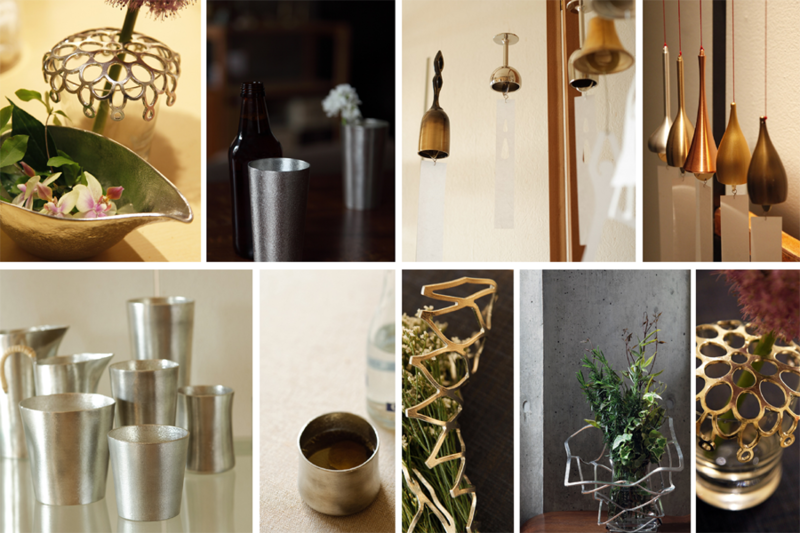 This is why we propose that you may use beer cup or sake ewer as a nice flower vase. Or, it is also recommended to enjoy tin wares for the table and drinks. 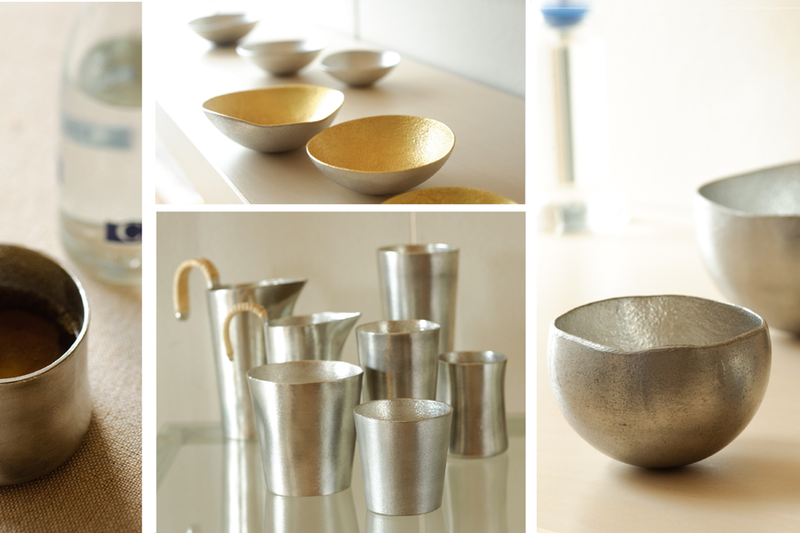 NOUSAKU produces what is generally called cups and ewers of over 60 different design. It has been believed that water in a tin container does not spoil, and tin removes excessive bitterness from sake and produces better taste. Professional sommeliers described with phrases such as “breezing” “feels more mineral” “more mild” “feels like it is decanted.” A sake sommelier expressed “enjoyed to feel the cool temperature of sake on my first contacts with fingers and lips, to see the sake gradually gets softer and purer in the tin cups as the time goes by. It would be interesting to taste young sake just bottled and closed, to see the gradually change in the tin cups.” This is why we recommend these tin cups for sake beginners and starters, as well as sake-lovers. 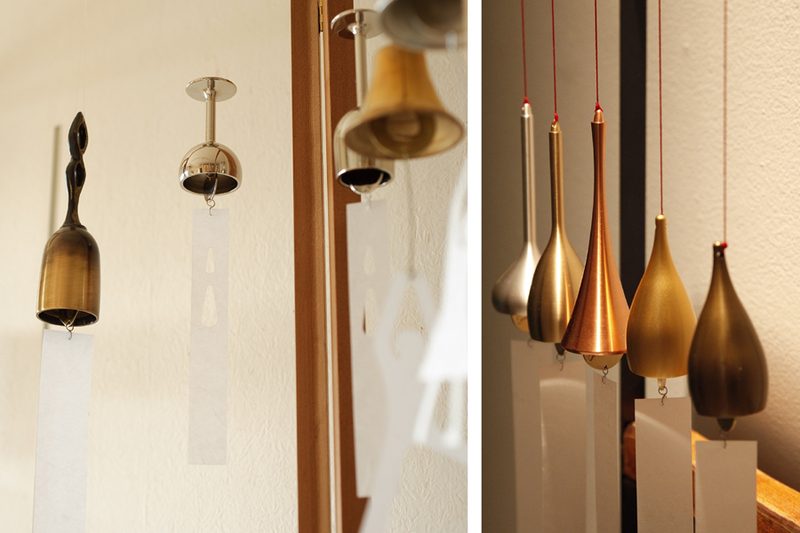 Of over 400 products in our catalogue, about 70 are these brass wind bells. These wind bells are handmade using techniques of ancient, traditional green sand casting method and finishing techniques passed down over more than 400 years in Takaoka, Japan. From old days in Japan, people hang these bells by the window during summer season to help cool off on hot and humid days. Recently, because of their soothing tinkle, we recommend these as relaxing and healing item; to hang by the bed or to put several pieces together and enjoy the sound throughout the season. We do have gift boxes and wrapping paper. For any questions or inquiries, feel free to contact us via Contact Us. In Tokyo, staffs at Palace Hotel Tokyo may also support you in either Japanese/English.